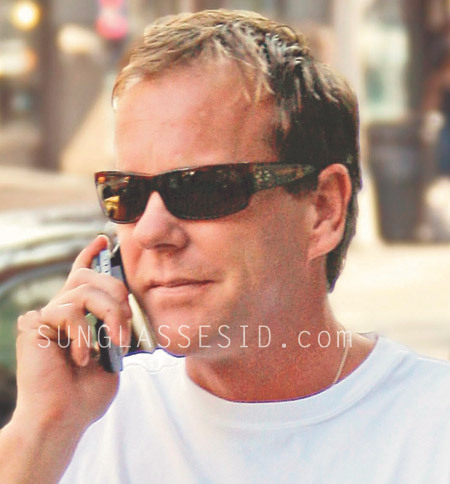 Kiefer Sutherland, the actor best known for his role as Jack Bauer in 24, was spotted wearing Blinde Mac Steed sunglasses. He wears a dark tortoise pair with brown lenses. The Mac Steed is not available in the Blinde catalog, but used to cost around $260. You can still find the Mac Steed on Amazon for only $99.99 (also available in black). Blinde is famous for having designed the Matrix sunglasses, and many celebrities have been seen with glasses from this brand, including Britney Spears (Ga Ga Galore), Nicole Kidman (Cya Round), Jennifer Garner (Particularly Peculiar), Naomi Watts (4 Sure), Julia Roberts (Bagel), Leonardo Di Caprio (Shuffler), Eva Mendes (Ga Ga Galore) and Sharon Stone (Talk To Me).